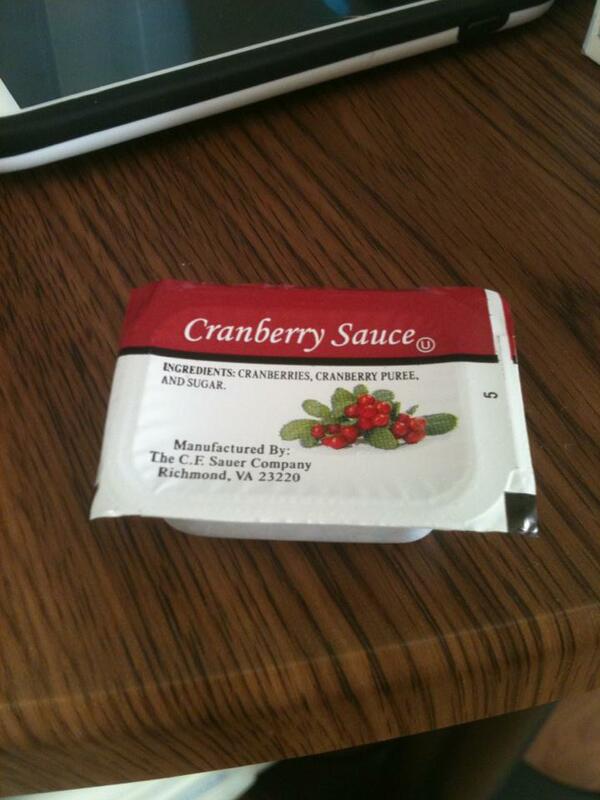 When you have a turkey dinner while you are in the hospital, here is the cranberry sauce that you get. I just thought it was the cutest little thing! This year, I’m very thankful that we won’t know that is the type of cranberry sauce you get in the hospital. As much as I miss my brother this Thanksgiving, I am very thankful for all of the time I did have with him and I know that he is out of pain and looking down on us today. Very soon we will be gathered around the table and everyone will state what we are thankful for. Every year this tradition always makes me a little teary eyed so I try and plan my statement in advance. I had no clue what I was going to say, what could I say that wouldn’t bring myself to tears? I’m thankful for the time that we got to spend with Lee. And Lee, if you’re here with us listening, I’m still going to plant a tree and your honor – and I’m so going to decorate you! It’s a joke that Lee was okay with his ashes being spread around a new tree as a memorial, but he really didn’t want to be decorated every Christmas! He’d just laugh at me and go “yeah, no!” every time I brought it up! So, this year, I’m thankful for all of you out there in the blogosphere who have been with me as I journey along, I’m thankful for my friends who have held me up when I couldn’t stand, and I am very thankful for my family and the time we’ve had together! I’m also thankful for the eye candy that Dean Winchester supplies, Starbucks coupons and decorated sugar cookies! Wishing all of you and your families a very Happy Thanksgiving and for my Jewish friends – Happy Hanukkah! I’m so blessed, I’ve been nominated for a couple of awards and I can’t wait to share them with you – not because I’m so awesome, but because this gives me a chance to introduce you to other bloggers out there that you might not know about! 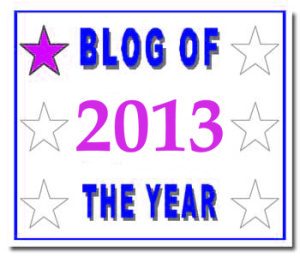 First off, thanks ever so much to Kerry at Winding Road for nominating me for the Blog of the Year 2013! This award was created by the Thought Palette and the nice thing is, I don’t have to do anything! All I have to do is introduce you people to some of the bloggers who have really impressed me this year! If you don’t follow Kerry at Winding Road, I highly recommend that you do, she is such an inspiration as she pushes her limits, tries new things and help me realize that it’s okay to step outside our comfort zones! Of course, she doesn’t realize that she does all of this, but the fact that she’s doing the daily Haiku challenge for the week pretty much embodies everything I mentioned! Graced by Emilie – It’s fun to read about Erica raising her two little kids – she’s about 10 years behind me, so it always brings back good memories! Plus, she frequently posts pictures of her adorable kids! Surviving the Madhouse – Holly has become one of my great friends and I have so much fun trying to decipher when she speaks “Canadian”. I kid! And that’s why I love Holly, despite all that she has been through, she still laughs and jokes and teases right back – plus, she loves Doctor Who! To See the World in a Grain of Sand – Irish covers such a variety topics on her blog, and it’s always interesting to see what she’ll come up with each day, plus, she’s an avid reader like me! Oh, and she has a nail polish obsession, it’s pretty cool! 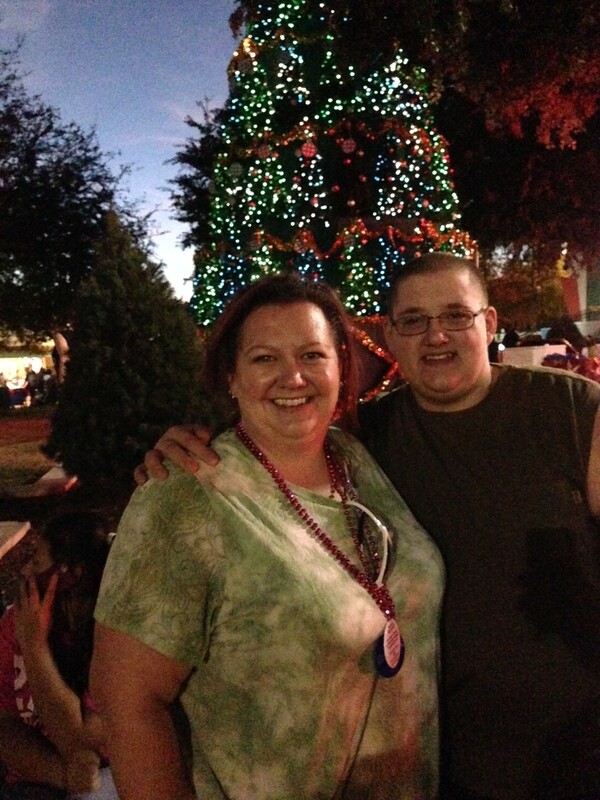 Today’s Manager – Cranston helps me grow as a person and as a manager, his blog is full of wonderful stories that help us become better people and manager ourselves and others! 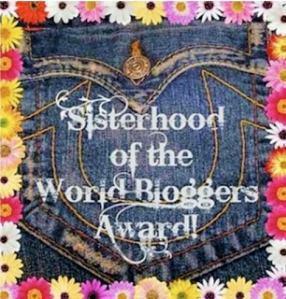 Thank you Shaun at Looking for reasoning to a complicated world, I am happy to accept the Sisterhood of the World Bloggers Award. I can’t think of a single topic that Shaun hasn’t addressed in his blog and I think you all should go check him out! 1. Your favorite color – Purple baby! The color of royalty! And it really fits, if I do say so myself! 2. Your favorite animal – Stuffed, like a teddy bear. 3. Your favorite non-alcoholic drink – Sweet tea! I’m from the South, sweet tea is it’s own food group! 6. Do you prefer getting or giving presents? – Both! I love the joy of giving a gift; however, I really do love receiving them, too! 7. Your favorite number? – All of the even ones! Some of the odd ones. I like the ones that will be on my winning lottery ticket! 8. Your favorite day of the week? – Saturday and some Tuesdays – the occasional Thursday. Wednesdays are good, too. 9. Your favorite flower? – Um, one that smells pretty, doesn’t require much maintenance, doesn’t have a lot of pollen. I don’t know flowers, so I can’t give you a real answer. What’s that one that looks like a bird? Or, is there a purple one? 10. What is your passion? – Life. My passion is making sure that I participate in my life! And my son, I’m pretty passionate about that. And cookies… I would have to say that cookies make me pretty passionate. All of the links should open in a new window, and they are my fellow female bloggers from around the world. You won’t be disappointed if you click and check them out! Thank you very much Vanessa at Pink Butterflies for nominating me for this award! I think you all should go give Vanessa a follow, her blogs are always so much fun to read! 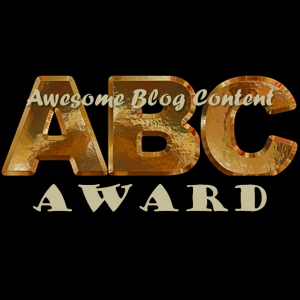 Rules for accepting the Awesome Blog Content (ABC) Award. Present 8 deserving Bloggers with the Award. Write a word or phrase about yourself for each letter of the Alphabet. 8 other deserving Blogs to receive this award. Words or phrases about me for each letter of the Alphabet. I – I hate these things! K – Kudos for making it this far! W – Whatchu lookin’ at? Y – Y are there so many letters? I’m really hoping that all of you go check out Kerry, Shaun and Vanessa, and the other bloggers that I have nominated in this post. There are so many wonderful blogs out there and it’s always good to keep an eye out for someone new! Thanks for sticking through to the end! There are so many wonderful bloggers out there and if I failed to list you, it’s an oversight on my part, not yours! 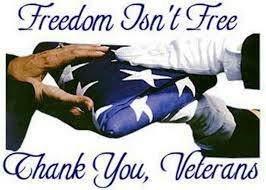 Thanks to all of you for being there for me, reading my posts, my comments and for keeping me entertained! So, maybe I am a bit sentimental. Or, maybe it’s just this time of the year. I love the holidays, once we hit October 1st, I’m on a high the rest of the year (of course, some of that could be the candy and breads and other goodies!). Halloween is super fun, Thanksgiving is a great time to renew my vow to live a life of gratitude, but Christmas, Christmas is all about the family life I’ve made. Not just the nuclear and extended family, but my friends that have become family, too. 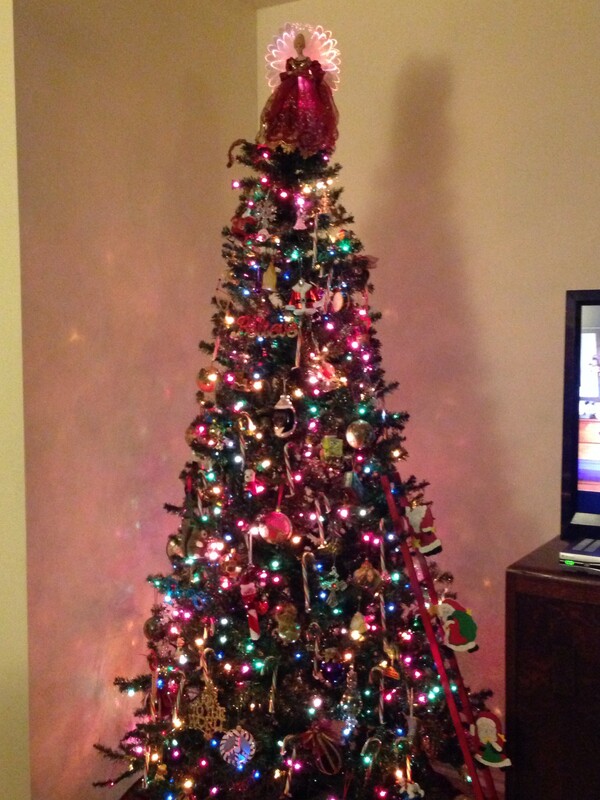 Our tree is nestled in the corner of the living room, out of the way but still visible from every angle. 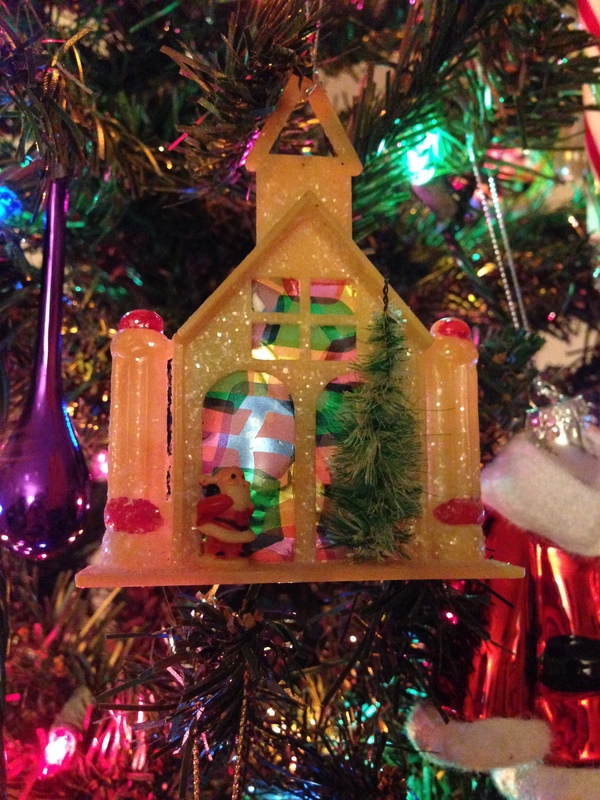 Here is the little stained glass church that was one of my childhood ornaments. 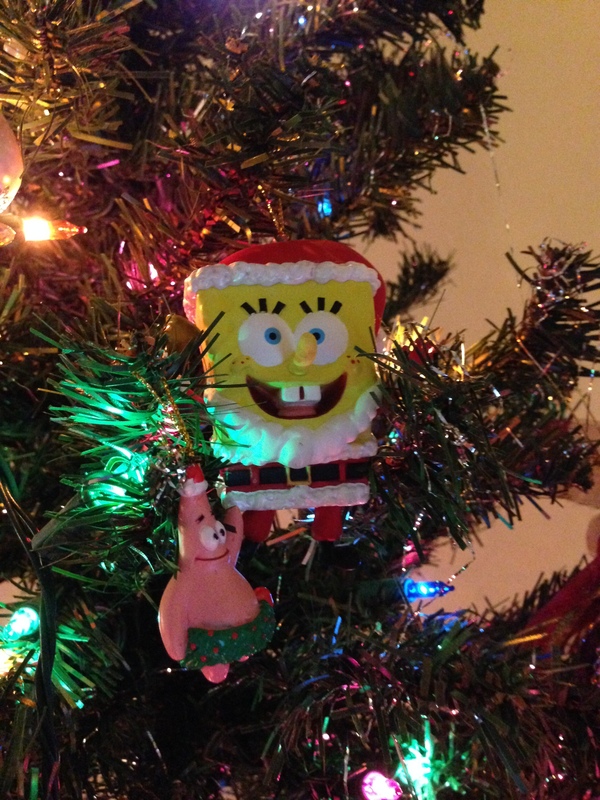 It is the first ornament to go on the tree, period. Nothing goes on until I have placed this little guy. I absolutely love this ornament. I don’t remember when I got it, but it will always be my favorite! Look! It has my name! All the way back from 4th grade!! Which also gives away my approximate age for those of you good at math! Merry Kissmas! 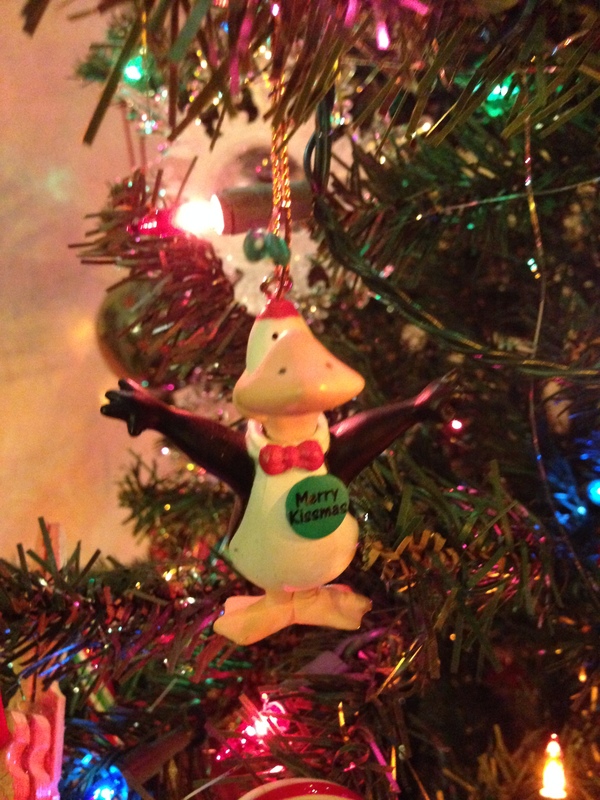 I got this ornament when I was a teenager – and you know you’re as old as me if you recognize the character! 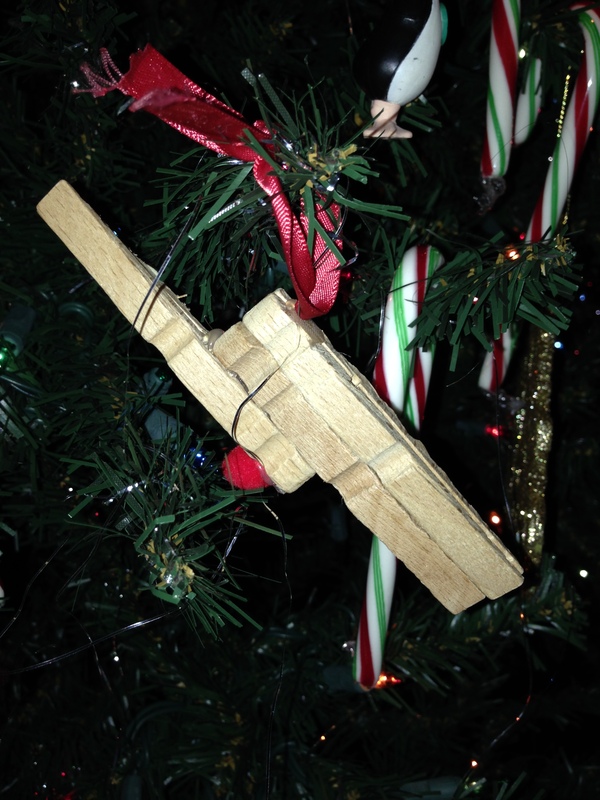 Here is a new ornament! My friend Kari sent this to me all the way from Alaska! It’s entirely too awesome for words! 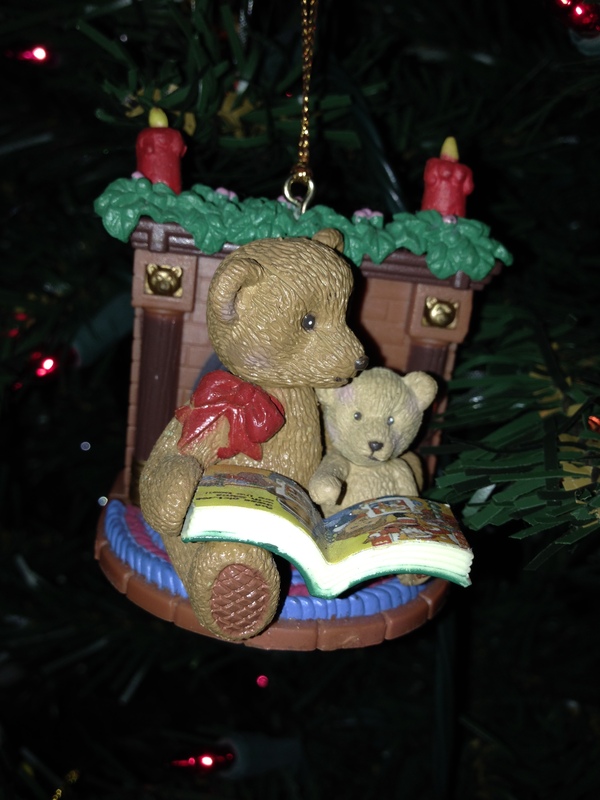 I bought this for Mr. T’s first Christmas – isn’t it adorable? I did have a traditional baby’s first Christmas ornament that was a beautiful blue china rattle sent to me by my friend Melissa; however, one year we dropped it and no amount of glue was fixing that! 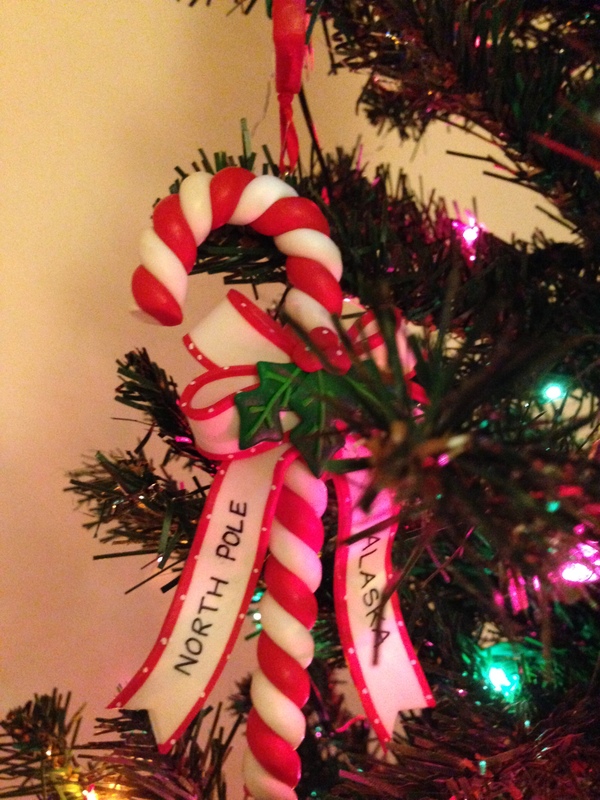 First off, yes, there are candy canes all over our tree. I load the tree up with peppermint and mint chocolate candy canes. Everyone has gotten used to this and almost everyone who visits automatically grabs one off the tree to enjoy – including me and Mr. T! 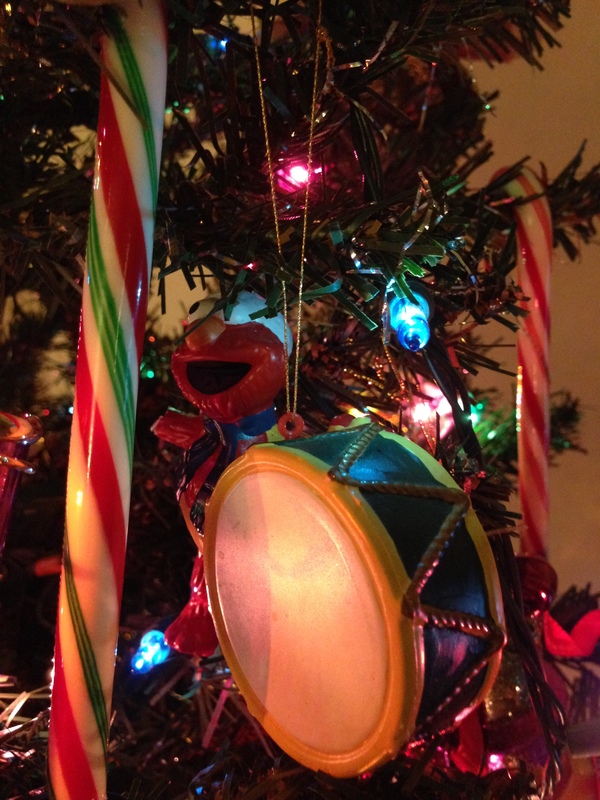 Nestled among the branches and candy canes is Elmo, the first ornament that Mr. T picked out all by himself. Here we have a cloths pin reindeer that Mr. T made when he was little. Even Spongebob and Patrick get in on the action. 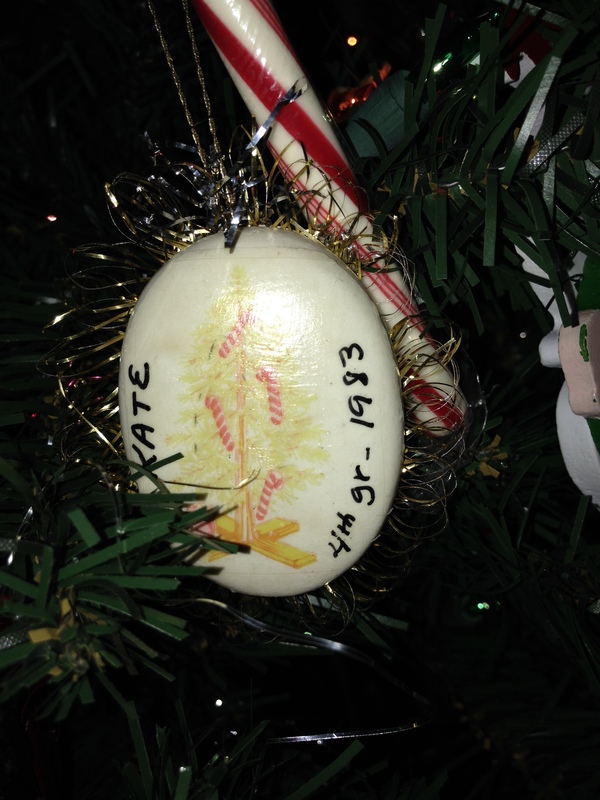 And, to be clear – those are two separate ornaments, I realize now that it looks like they are attached, but they aren’t. We also have Shaggy and Scooby doo and on the other side of the tree in a perpetual battle you will find Spiderman and Dr. Octopus. Putting up the ornaments gives me time to reflect on years past, think about the upcoming year and to spend 30 minutes with Mr. T where all we have to do is enjoy each other and sing along with Christmas carols playing in the background. We laugh and joke, reminisce and make plans and let the stress of the world melt away. 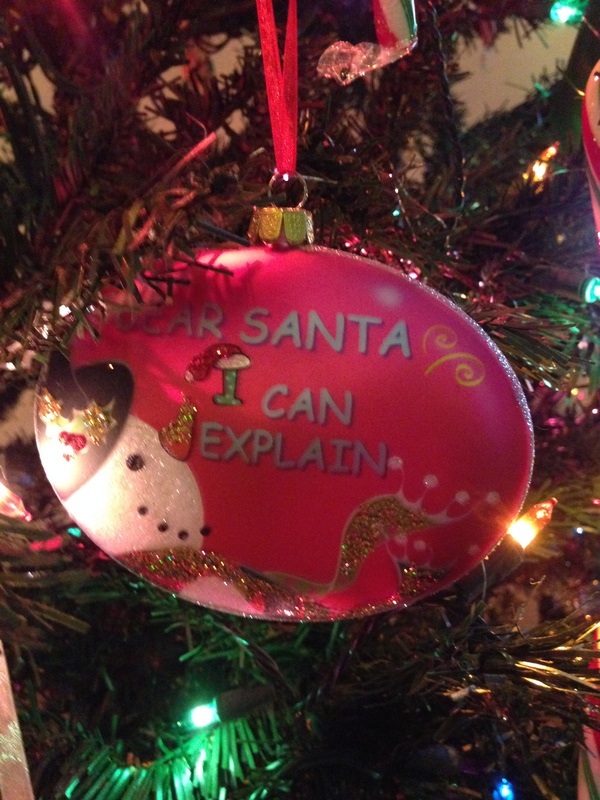 And then I put up another one of my ornaments… it pretty much speaks for itself! On a slightly related note – I now have to go search for Supernatural ornaments – cause I think that I’d enjoying looking at this every year! Maybe when I write my letter to Santa I’ll ask if he can just wrap up Dean Winchester and leave him under my tree! Last night was Diva Dinner, our monthly girls dinner – and it was awesome! I left the house just before 6 and got home about 8 pm. I opened the garage door, got out of the car and hit the clicker to close the garage door, walked to the house and all but broke my nose on the door leading to the house. It was locked! And, sadly, it’s not even a glass door and yes, there is a handle, but when you are used to one swift turn-handle-walk-in move, it’s hard to stop that momentum! I whipped out my cell phone and called Mr. T who came and let me in. Apparently earlier in the evening there was a loud pounding that hit the house and he couldn’t identify it, so he went through the house and made sure everything was locked up. He said that he heard people outside and that he thinks it was a car door slamming. Okay, the window in my room was cracked, so that sounded plausible. We finished up the night and went to bed and I didn’t think anything else of it. Today I saw on the news that there was an earthquake in one city over. I didn’t feel anything, so I didn’t pay attention. I worked a little bit, my boss and his family were leaving town this morning for vacation so we were rushing to get all of his stuff completed and once he was out the door I went to do my Couch to 5k training. I struggled through the training today. I’m on week 8, which is the last week, by this week I should be able to run non-stop. Today I couldn’t. Fortunately, I’ve learned it’s okay to have days like this – and since it’s been weeks since I had a bad run I chose to be okay and not let it get me down. I finished early and got ready for a morning meeting. After my meeting I ran to the store to get a new pair of work out pants since I had a coupon that was about to expire. I picked what I needed and the sales associate was so helpful, I asked her to help me see if we could find me a new pair of jeans. For almost the past year I’ve been able to take my pants on and off without undoing them. It’s pretty handy; however, the past couple of months it’s gotten bad – if my phone is in my pocket then my pants start to slide down. This is becoming unacceptable, especially since getting me to remember to put on a belt just isn’t happening! So, we picked out about 5 pairs. I tried several on and finally found one pair that fit like a dream. Two sizes smaller than the ones I was wearing!! Let me repeat that… TWO SIZES SMALLER!! Tonight I called my mom. Tomorrow she is having knee replacement surgery. To replace the artificial knee she had done just over a year ago. Which she had redone two days after the fact because the patella (knee cap) wasn’t attached properly. You can’t make up the stuff that happens in my life. I wanted to make sure we were on the same page, let her know that had coordinated with her mom and that we wouldn’t be far behind her and dad. She asked me if I felt the earthquake last night. Nope – but if she felt it, then I’m surprised that I didn’t. She was surprised, too and went on to tell me about her experience, and how it was like a loud pounding hit the house (sound familiar? 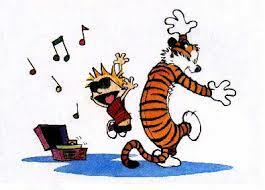 Go re-read Mr. T’s account) and then the dogs went nuts! So, now I’m curious… about what time was it? Well, no wonder I didn’t feel it, I was several cities south at dinner! When I hung up the phone with her, I double checked and sure enough, a 3.6 quake hit one city over and the shock wave was felt far and wide! I told Mr. T what happened and he laughed and said it was nothing like how TV depicts an earthquake! So, that’s how an earthquake locked me out of my house last night! I’m still such a kid at heart. 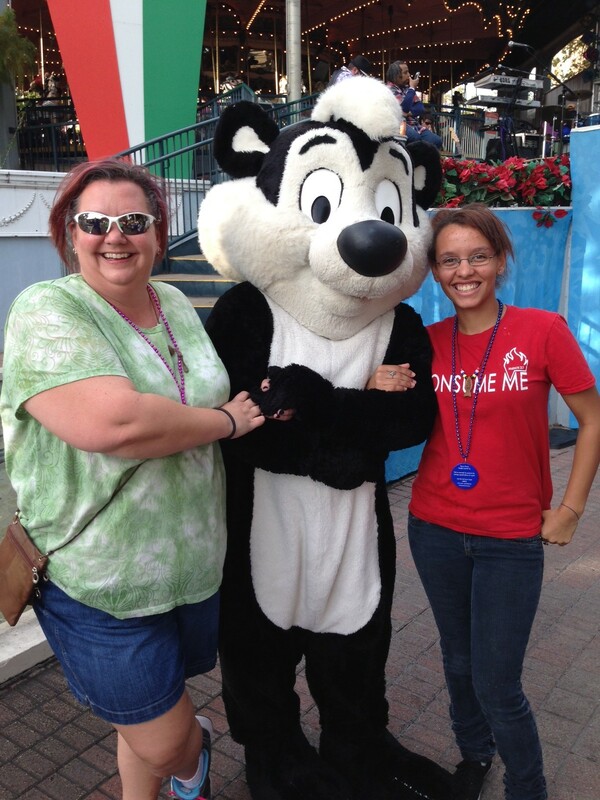 Yesterday was Six Flags day. For those not aware, it’s an awesome amusement park. When my brother Lee was young, he and I had season passes and went all of the time. Now that I have Mr. T, we try and make it a couple of times every year. I love it! 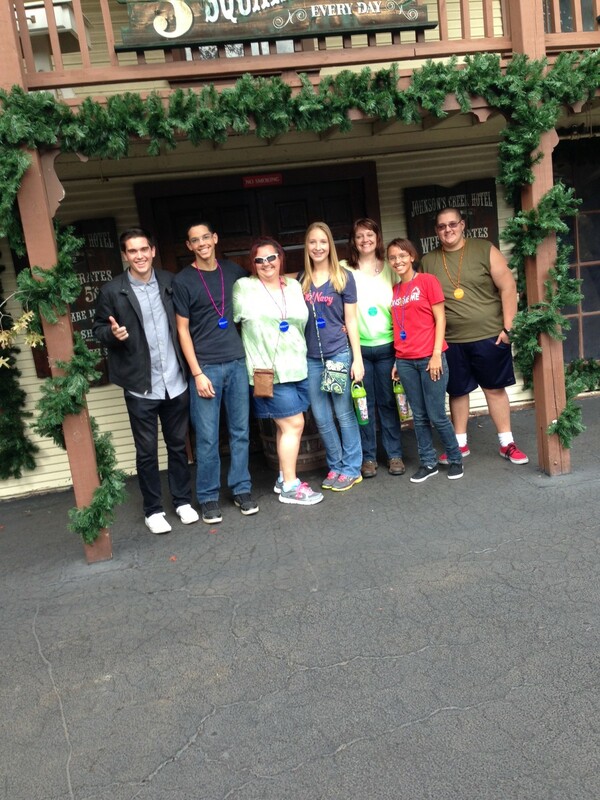 I have so much fun walking through the park, riding the rides and examining everything the gift shops have to offer! The last person to take a drink has to hold the mug – if they try and hand it back to you, just pretend you can’t see them. You are never too old for Yosemite Sam. Alright Six Flags, Bring it!! Mr. T, Me, Samantha and Jayman. 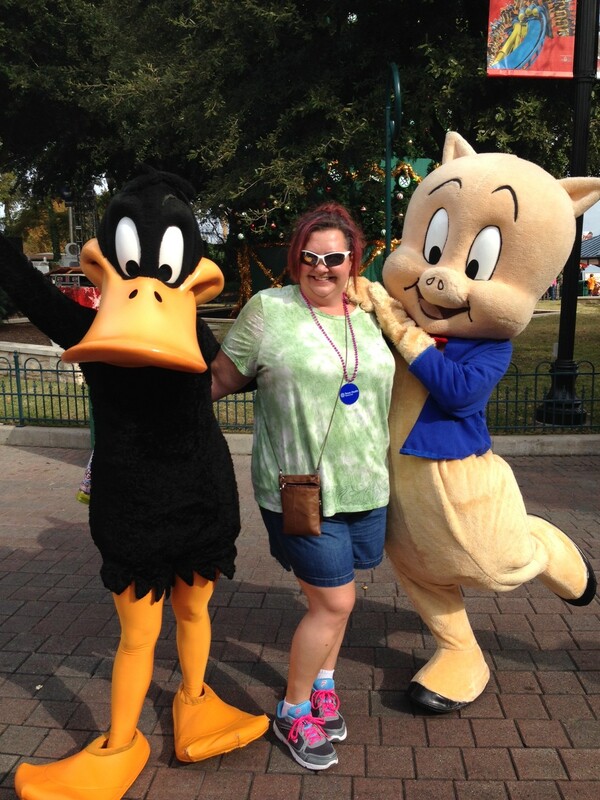 Most kids line up for pictures with the characters… and then there is me. Funny story. 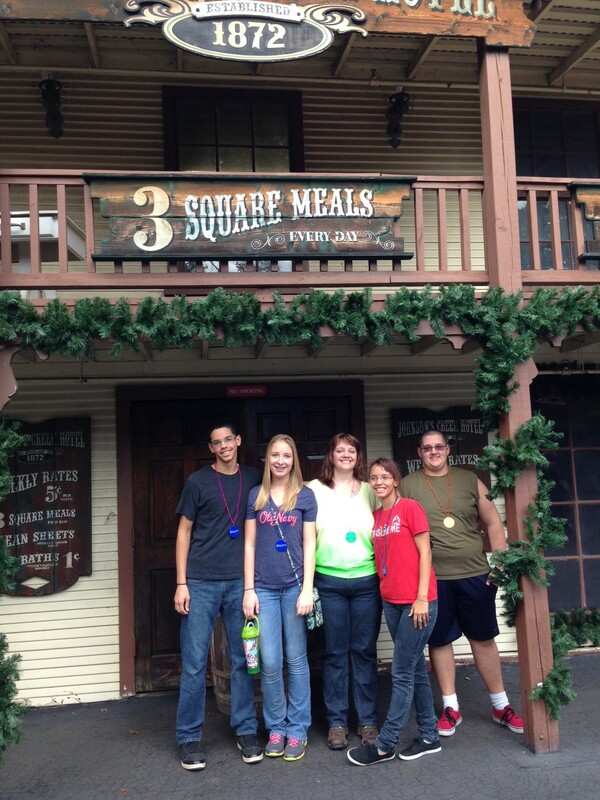 As I was taking this picture, a Six Flags host walked up and asked if he could take the picture so I could be included. Of course!! As I was running over to join the family a random stranger yells out “Hey, I want to be in the picture!” Now, most families would be “no way!” but not our family! We were like “Come on random stranger! Join our group picture!” So, random guy is on the left. He was a good sport! End of the day and another selfie with Mr. T, in front of the huge Christmas Tree. It was a wonderful day and a great time was had by all. 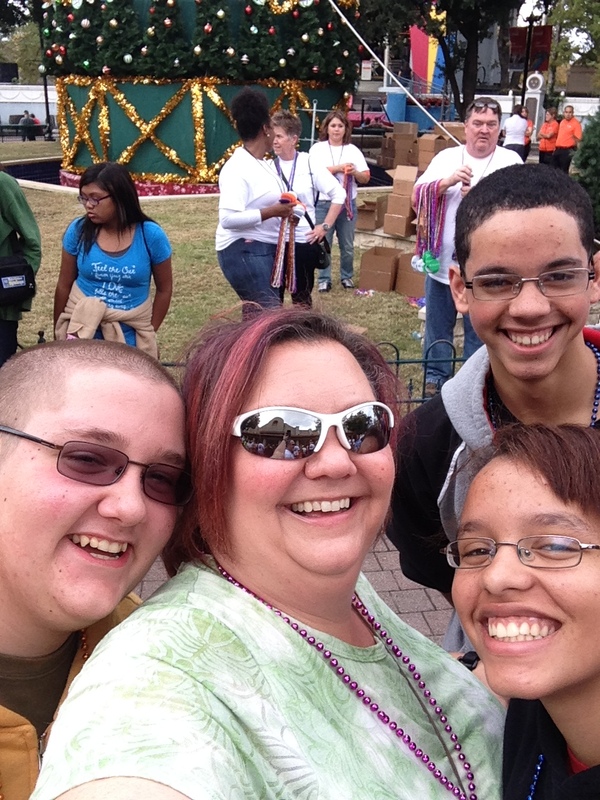 And yes, that happened – I may or may not have groped the arms of a 17 year old kid. Winter weather has come to Kansas! It is cold outside, folks. As I sat at my kitchen table Monday I watched the skies turn grey and the leaves start to drop off the trees like rain from the skies. A cold front was coming through. The temperature dropped about twenty degrees in a matter of three hours, in the middle of the day! As I sat shivering I decided that I needed to make some ‘comfort food’ for dinner so I immediately set out to find a healthier Chicken Pot Pie Recipe. I polled The Hubs and Daughters Three and Four to see if the preferred a pie crust style pot pie or a biscuit style pot pie. They did not care. 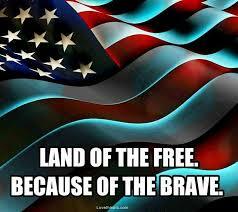 Thank you to the men and women of our Armed Services, those who have, who are and who will serve our country so that I can enjoy the freedoms I have.